Foundations have a heavy responsibility to invest for the social good. 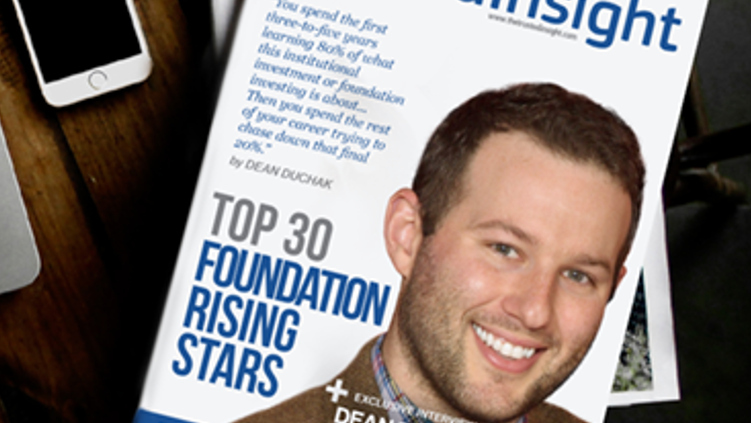 Trusted Insight's ranked list of Top 30 Rising Stars At Foundations introduces the most promising investment directors, vice presidents and managers at foundations, who are the next generation of institutional investing leaders. These investors are critical to ensuring that foundations continually benefit society, now and into the future. Gain insights from foundations at Trusted Insight Alpha Conference 2017. James Geary is the director of investments and chief financial officer of Maine Community Foundation. Geary has been in this role for 14 years. He has a B.S. in Accounting and an MBA from the University of Southern Maine. Brian Doyle is the vice president of investments at the Dallas-based Communities Foundation of Texas. The foundation has more than $1 billion in total assets, consisting of approximately 950 smaller funds. Doyle attended Manhattan College. He serves as a board member on multiple non-profit organizations in Texas. Brett Johnson is director of public investments at the William and Flora Hewlett Foundation. Previously, Johnson co-founded and was chief investment officer of Alesco Global Advisors, which managed three mutual funds before the firm was acquired. Johnson holds a B.A. in Economics and International Relations from Stanford University and an MBA from Wharton. Michelle Pak is managing director at The Rockefeller Foundation. She is a Chartered Financial Analyst. Elaine Orr is the director, investments at Silicon Valley Community Foundation. Elaine Orr supports the investment committee and Board in the stewardship of SVCF’s charitable capital. She partners with donors, nonprofits and their investment advisors in framing investment policies and implementing asset allocation to manage risk, return, as well as social impact. She leads the management and oversight of the individually managed fund program. Previously, she spent 15 years in portfolio strategy and client relationship roles at BlackRock. She is a Chartered Financial Analyst, and has a B.Comm in Finance from The University of British Columbia. She is a board member of Pangea Legal Services which supports immigrants particularly in the area of deportation defense. Chris Barber is associate director of private equity and real asset investments at Ford Foundation, which has $12B assets under management. Chris manages a $3B portfolio of illiquid fund investments spanning venture capital, buyouts, real estate and natural resources. He previously worked as an investment associate at Stanford Management Company. Chris is a Chartered Financial Analyst, and has an MBA from Harvard Business School, and a B.S. in Finance from Penn State University. Jenny Yip is a senior program investment officer at the Bill and Melinda Gates Foundation, which has $39.6B assets under management. Previously, Jenny was a vice president at Goldman Sachs. She has an AB in History of Science from Harvard University. Kimberly Sargent serves as senior managing director at Packard Foundation. Prior to joining, she was a consultant with McKinsey & Company, and a senior analyst at Yale Investments Office. Kimberly is a CFA charter holder and holds an MBA from Stanford's Graduate School of Business and a B.A. from Yale University. Tom Mieczkowski is an associate director of investments for the Hewlett Foundation, which has $9 billion of assets under management. Before joining Hewlett Foundation in 2014, he had worked at AlpInvest Partners, a New York-based asset management firm, with a focus on private equity and venture capital commitments in the Americas, and Zurich Alternative Asset Management. Mieczkowski has a BBA in finance and consulting from Emory University. Ken Lee is the associate director of investments of Carneigie Coporation. He co-leads the foundation's portfolio strategy for marketable investments, which include long-only, absolute return, and fixed income asset classes. Previously, Lee started out his career as an investment bank analyst and later worked at multiple private equity and hedge fund firms. Lee holds an MBA from the Wharton School at the University of Pennsylvania, and a BA from Yale College, where he studied Economics and East Asian Studies, with a focus on the History of Art. Jay Donato is investment manager at The Pittsburg Foundation after being promoted from senior investment analyst. Previously, Donato served as senior portfolio analyst at Coury Financial Group, investment consultant at Select Financial Group and financial associate at Union Financial Partners. Donato holds series 7, series 66 and series 24 licenses, and he is a CFA charter holder. Donato holds a B.S. in Finance from John Carroll University. Silpa Pericherla is the associate director of David and Lucile Packard Foundation, working broadly across the foundation's portfolio. Prior to joing the foundation in 2010, Pericherla was on the direct investing side with positions at Seneca Capital, R6 Capital, and the Carlyle Group. Silpa holds a B.A. from Yale University and is a CFA charter holder. Anabel Luna is the investments director at California Community Foundation, managing the foundation's investment portfolio. She also works closely with Development and Donor Relations staff on the investment aspects of asset development. Luna previously worked at KPMG as a manager and Houlihan Lokey, a global investment bank.. Luna holds a M.S. in Industrial Engineering from Columbia University and a B.S. in business administration (finance) from CSU Northridge. Evan Pan is director of investments at the Fuller Foundation, overseeing the portfolio's hedge fund, private equity, real assets allocations. Previously, Pan was director of public market investments at Caltech, investment associate and trader at Dimensional Fund Advisors and vice president at PIMCO. Pan is a chartered financial analyst, holds a B.A. in Economics from University of California Irvine and an MBA from University of California Los Angeles. Michael E. Buchman is director of investments at Conrad N. Hilton Foundation. He supports the strategic development and ongoing management of the Conrad N. Hilton Foundation’s investment portfolio, which has $5.4B asset under management. Prior to joining the Hilton Foundation, Buchman worked in the areas of finance, real estate, and law at Broadway Partners, Citigroup Global Investment Bank, and the law firms of Fried Frank Harris Shriver & Jacobson, and Skadden Arps Slate Meagher & Flom. Buchman received a juris doctorate degree from the University of Pennsylvania Law School, and a MBA and a bachelor’s degree in economics from The Wharton School at the University of Pennsylvania. Melissa Richlen is the manager of private equities at MacArthur Foundation, which has $6.47B in assets under management. Previously she was the marketing associate at Foothill Capital Corporation. Richlen holds a BA in accounting from the University of Wisconsin at Madison, and an MBA from Northwestern University. Mark Rich is the director of investments at Kimbell Art Foundation, managing the foundation's current portfolio and evalutaing future investment opportuniteis. 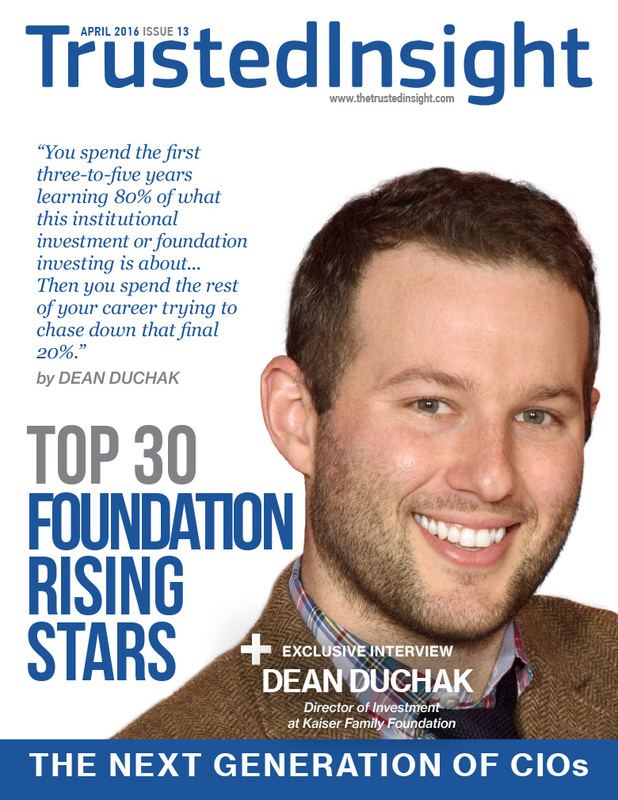 In 2014, Rich won the AICPA Young CPA of the Year Award in honor of Maximo Mukelabai. Rich previously worked at Ernst & Young. He holds a master degree in accounting and a bachelor degree in accounting and finance from Abilene Christian University. Dean Duchak is director of investments at Kaiser Family Foundation. He previously worked as a financial analyst at J.P. Morgan Chase. He has a B.S. in Finance and Accounting from The McDonough School of Business. Sean Feng is the investments director of the Kresge Foundation, a $3.6-billion private foundation based in Michigan. Before joining Kresge in 2011, Feng was an equity portfolio manager. He began his career conducting fundamental stock research for Citigroup Investment Research and later worked as an equity analyst covering U.S. small- and mid-cap stocks in a money management firm. Feng has an MBA from the University of Chicago and a M.S. from the University of Texas. Ted Heilman is director, senior portfolio manager at Van Andel Institute. Previously, Heilman was a consultant at Ultra, Ltd.
Steven Kaell is investment manager at Memorial Sloan-Kettering Cancer Center, after being promoted from investment associate in December 2015. Previously, Kaell held various positions at Landmark Advisors including analyst, senior analyst and director of research. Kaell is a CFA charter holder and holds a B.A. in Mathematics from Brown University. Melissa Lopez is the director of investments at the James Irvine Foundation. Prior to joining the Foundation, she was a senior research analyst with Wetherby Asset Management. Lopez holds an MBA from the Stanford University Graduate School of Business and a BA in business administration from the University of Texas at Austin. Jeffrey Jackman is director at the William Penn Foundation. Jackman is involved in manager selection, due diligence and asset allocation covering all asset classes and specializing in real assets, credit and fixed-income strategies. Previously, Jackman worked at J.P. Morgan Investment Management from 1994 to 2008, rising from an analyst to vice president and portfolio manager of fixed-income assets. Jackman holds an M.S. in Banking and Financial Management from Boston University and a B.A. in Economics from Rutgers University. He is a CFA and CAIA charter holder. Cheryl Sauve is the director of investments at Casey Family Programs, a foundation focusing on reducing the need for foster care and build better communities for children and families. Prior to Casey Family in 2007, Sauve wroked at UBC Investment Management Trust and Hewitt Associates. Sauve holds a bachelor's degree from the University of Waterloo. Anthony Thai is senior investment officer at The Wallace Foundation where he assists the chief investment officer in overall management of the foundation's portfolio. Before earning his MBA in 2012 from New York University, Thai was an economist at Compass Lexicon. Prior to joining the Foundation, Thai was an investment intern at the NYU Investment Office. Thai is a chartered financial analyst and holds a B.A. in Economics and Statistics from University of Chicago. Nicholas Csicsko is investment director at Sloan Foundation, and professor at The Julliard School. He is a Chartered Alternative Investment Analyst, has a doctorate and masters in Music from The Julliard School and a B.A. in Music from Indiana University Bloomington. Rodney Overcash is investment director of credit strategies for each of the three grant making entities that make up the Margaret Cargill Philanthropies: Margaret A. Cargill Foundation, Anne Ray Charitable Trust, and Akaloa Resource Foundation. Previously, Overcash served as investment director of credit alternatives and real assets for North Carolina Investment Management and director of research at Marquette Associates. Overcash holds a B.A. in Economics and international relations from University of North Carolina Chapel Hill and an MBA from the University of Chicago. Amy Jensen is the investment director for the Northwest Area Foundation. Having joined the Foundation in 2013, Jensen leads the investment of the Foundation’s $420 million portfolio with responsibility for all asset classes and strategies, including the Foundation’s mission-related investments. The mission of the Foundation is to support the efforts by the people, organizations and communities of our eight-state region to reduce poverty and achieve sustainable prosperity. Immediately prior to joining the Northwest Area Foundation, Jensen worked for the Margaret A. Cargill Philanthropies as a portfolio manager. In this role she managed the assets of the Margaret Cargill Foundation, Akaloa Resource Foundation and the Anne Ray Charitable Trust. Jensen previously worked in the Investments Office at Bowdoin College in Brunswick, ME. The Investments Office is responsible for the management of the College’s internally managed endowment. Amy has a bachelor’s degree in economics and communication studies from Macalester College in St. Paul, Minn., and a master’s from the University of Minnesota. She holds the Chartered Financial Analyst and Chartered Alternative Investment Analyst designations. She is a member of the National Finance Committee for the Jeremiah Program and a former member of the Financial Leadership Committee of the Women’s Foundation of Minnesota. Benoit Wirz is the director of venture investment of Knight Foundation. He was recently promoted to this role in 2014. Wirz manages the Knight Enterprise Fund, a $10-million venture fund that invests directly in early-stage media innovation companies. Wirz has an MBA from INSEAD and a M.A. and a B.A. in International Relations from Stanford University. Jenny Chan is a senior investment officer of Doris Duke Charitable Foundation. In her 20-year career as a finance professional, she had worked at Moore Capital Management, McCormack Advisors and Canterbury Consulting. Chan has a bachelor's degree in Finance and Accounting from New York University and a certificate of Sustainable Investment from Columbia University.